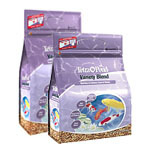 Tetra Variety Blend - Floating Premium blend of 3 foods to enhance vitality. Pond Sticks: an ideal, basic diet. Koi Vibrance: enhances natural coloration. Wheatgerm Sticks: for health and vitality.